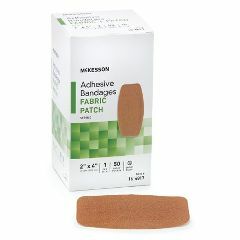 AllegroMedical.com presents The McKesson Adhesive Strip -Small. Flexible, durable fabric. Stretchable for added comfort. Helps protect cuts and scrapes by conforming to skin with an absorbent, non-stick pad. Sterile individual packages help promote cleanliness and further protect against infection. Features comfortable fit, long-lasting adhesive.